Reliable stump removal service for all of Newcastle. Get your yard in shape now for spring and summer. Make sure it’s a safe space for your pets and kids to play by getting rid of stumps on your property. Winter storms can knock over trees and leave dangerous and unsightly stumps. StumpTech can remove those stumps quickly and easily for a low cost. 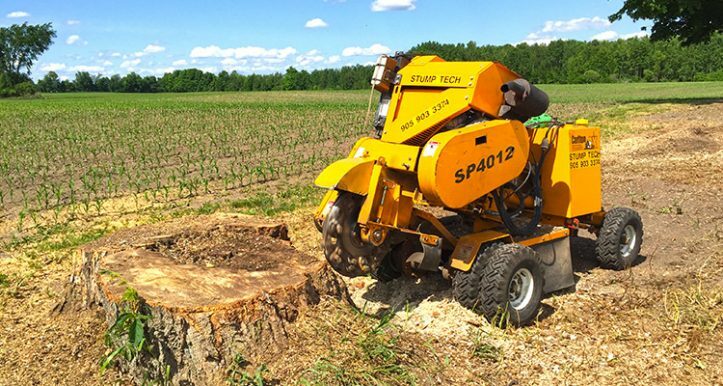 Our technicians have more than five years of experience removing stumps from all kinds of properties. If you have a small property that is fenced in our techs can use a small stump grinder as long as there is a 36” opening. That’s all they need. And if you have a large property they have the right equipment for that too. Do you have a large property or yard? Or do you have multiple large stumps that need to be removed? Our well trained crew can handle any stump removal job no matter how large the property is or how many stumps need to be removed. Our technicians will always get the job done right the first time. To get a personalized quote for stump removal call us today. There is no cost for a customized price quote. StumpTech does have a minimum rate of $150 (+HST) for any work that is done. The estimate is no cost to you, but any stump removal work falls under the minimum fee. Often more than one stump can be removed for the minimum fee without incurring more costs. 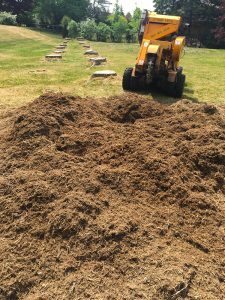 Why Hire A Professional Newcastle Stump Removal Company? 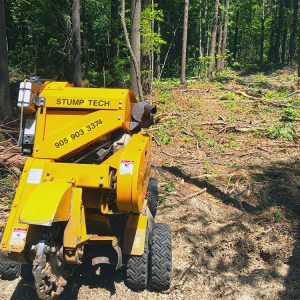 There are a few different reasons why it’s a smart idea for homeowners to hire a professional stump removal company liked StumpTech. A professional team will do a better job removing stumps because they have the training and expertise to do the job quickly. Your property will look better when stumps have been professionally removed. But the biggest reason why you should call a professional to get stumps on your property removed is safety. Safety is a big concern during stump removal. Stump removal equipment hazardous if you don’t know how to use it. And removing stumps without using professional grade equipment is just not smart. You can watch some videos online and get some advice on how to remove stumps, but that doesn’t mean that advice will work on the stumps that you have. You could end up getting seriously hurt if you try to remove a stump with the wrong equipment or with equipment that isn’t actually designed to remove stumps. And unless you’re a professional contractor you won’t have access to the high grade equipment that stump removal professionals have access to. So stay safe and let the professionals at StumpTech remove those stubborn stumps on your property.